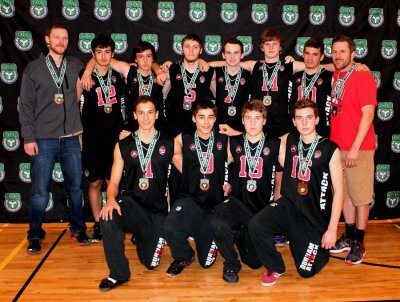 Durham Attack Black 16U boys came into the Provincial Championships ranked 12th of the 29 competing teams. The first day saw the team in some very intense games. Versus the Markham Stingers, the boys started a little slow, but after a couple of inspiring digs and hits from Jared and Alex H., the pacing steadied and balanced attacks with solid defense from both sides made for a close set. Unfortunately, after leading for most of it, Durham stumbled and lost 24-26. The second set saw more misfortune for Durham Attack, dropping the set 15-25. Game 2 vs Hometown team Predators Purple was a better example of what Durham is capable of. Led by strong serving from Tristan and Brad, aided by a solid wall of blocking from John and Jon, the boys won the 1st set 25-19. Set 2 was a more even affair as both teams fought hard for every point. With fewer mistakes on their side of the net, the Predators prevailed 23-25, requiring a 3rd set tiebreaker. Durham Attack’s serving game was doing the job, but Predators defense was too strong and they took the set 10-15. Game 3 against the Etobicoke Eagles saw another strong start for Durham Attack as Connor and Jon combined for those all important lead taking points. The Eagles fought back, but couldn’t catch up and Durham won 25-19. The 2nd set was a delight for Attack fans, with excellent serving from Alex T. and Tyler helping achieve the initial lead. Hard hits from Tristan on the right and Alex H. on the left kept any rallys to a minimum, but there were a couple, keeping the game interesting. Durham’s 25-18 triumph gave them 3rd place in day 1 pool play. Day 2 was a better day for Durham Attack, as they finally got their groove back and took the day, beating Peel Selects 97 25-10 & 25-17; Toronto’s Leaside Thunder 25-13 & 25-20; and Windsor’s RVC 25-21 & 25-14. The result: 1st place in day 2 pool play. Day 3 was the challenging, competitive day it was expected to be. In their game vs Aurora Storm, Durham Attack was a little shaky, making for a less than stellar start. While the hard serving of Alex H. and Jared, along with the solid hitting of Tristan, Connor and John kept them in the game, mentally the boys were struggling with some questionable calls. Some tension filled rallys raised the level of excitement for all but in the end Storm took the set 25-27. Fortunately, set 2 witnessed a renewed focus and determination on the part of Durham Attack. Concerted passing and setting by both teams resulted in tight back and forth action, but Durham took the early lead, didn’t let up and won 25-19. The tiebreaker was an example of focus, drive and consistent play. Cody was all over the court on defense, Jon served up back to back aces and the blocking was in-your-face, ruffling Storm and giving Durham a sound 15-8 victory. Game 2 vs Niagara Rapids was another excellent display of talent on both sides of the net. A hard fought contest with accurate setting, strong serves and solid blocking. A won rally close to the end stopped a brief drive by Niagara before Tristan’s huge 25-20 game winning block. The battle continued in the 2nd set, with Tyler serving hard, Cody digging deep and Alex H., Tristan and John slamming down point after point. Niagara fought hard but couldn’t overtake Durham, losing 25-21. The semi-final found Durham Attack in a rematch with the Markham Stingers. To say it didn’t play out as expected could be considered an understatement. Simply put, the Attack didn’t! They struggled throughout and went down to defeat in rapid succession 19-25 and 15-25. In an interesting turn, the Bronze medal game pitted Durham Attack Black against the #1 ranked Pakmen of Mississauga. These are two very evenly matched teams and it was evident the team making fewer mistakes would come out the victor. The 1st set was a point for point affair, with neither team gaining the advantage. It was a very exciting contest as both teams were in the zone, playing their respective “A” games. A final surge of deft serving, blocking and hitting gave Durham a 25-21 win. Set 2 had more seesaw action with not too many rallys, but challenging play from both sides. Durham came up short this time, handing Pakmen the 23-25 victory with a couple of unfortunately timed mistakes. But what is a medal game without a tension filled tiebreaker? So back they came, with Jon serving with accuracy, defense putting up a solid wall at the net and Brad’s setting to both left and right throwing Pakmen off balance. Pakmen tried disrupting the Attack’s momentum with timeouts, but the final played out as follows; Brad set Jared for a centre court slam, Jon served up an ace, Pakmen called a timeout and then Jon came back to finish it all with another ace. Durham Attack won the Provincial Championship Bronze medal with a 15-9 victory. Many thanks to coaches Mike Slean and Kevin Matthews for their direction, encouragement and leadership throughout the season. And it isn’t over yet. The Nationals are next. Tristan Swinden, Alex Hatzinikou, Coach Mike Slean. No, we couldn’t ask for better timing for the lads of Durham Attack 16U Black when it comes to regaining their winning ways, as a somewhat rollercoaster season draws to an end. In their last regular season tournament of this 2012-2013 season, the team is once again playing to their potential. In their 1st game of the day, DA made short work of the Stingers Gold, with winning scores of 25-5 and 25-17. While the boys did fall back on some bad habits early in the second set, allowing the Stingers to gain a 6-13 lead, composure wasn’t lost and with some exceptional serving from Alek, for 13 straight points, and defensive blocking at its best from John and Connor, control was reclaimed and the win achieved. Game 2 of the pool play against the Maverick Longhorns saw a continuation of that control. Although the Mavericks put up a more rewarding effort, the 1st set was almost all Durham Attack, decisively defeating the Longhorns 25-15. Spectators could see how the boys were following the ball more, positioning themselves for some splendid backup support. The 2nd set witnessed more pressure from the Mavericks, resulting in an exciting back and forth battle for the upper hand. With both sides scrambling and digging, the ball was kept in play, resulting in some delightful rallys. It took a run of 4 aces from Tristan, accompanied by solid blocking from John and Jared to finally gain the needed advantage, surge ahead in the points race and achieve DA’s 25-19 victory. Coaches Mike, Kevin and Todd have been mixing it up more in practice, moving the players around so they get familiar with all positions, and it is paying off, as everyone has developed the skills to step up anywhere. This was evident in the 3rd game of the day against the Kingston Pegasus Wings. When serving well, as Brad did to start the 1st set, a lead is built, confidence is gained and a rhythm is established. This was another short set, as DA stunned Pegasus 25-5. However, Durham experienced a slight let down in their serving early in the 2nd set, and this demonstrated just how important the recent training is. We saw inspired play from both teams, resulting in some lengthy rallys and a close match, with points being traded back and forth. While they never relinquished the lead, DA had to stave off the effects of a few misplays before regaining their composure and securing another win with a score of 25-18. The 4th game was an entertaining matchup between the Durham Attack 15U and 16U teams. (direct from my game notes – “15U takes 1st joyous point. And second! Are we kidding? Takes a missed serve for 16U to get into the game…or are they? It’s tied 6-6 for cryin’ out loud.”) Finally, thanks to some quality serving from Jon, 16U’s play came into focus and they started finishing plays. And then there is “dirty Brad”. His unexpected, tricky move at the net (can’t reveal details) certainly taught 15U they must be ready for anything. There were some stimulating rallys, but slams from Alek, John and Alex H. finished the majority of these in 16U’s favour. The set ended with a fine back court hit from Alex H. to win back possession, leading to a Tristan ace for the 25-14 win. While there were some positive moments for the 15U squad in the 2nd set, DA 16U essentially conducted a “how to…” clinic, on their way to a 25-5 shellacking. The Gold medal match against the Markham Stingers Black was a spectator’s delight. Once again Durham’s attack was centered on their consistent serving. Jon, Brad and Tristan were acing serves again and again, while Jared, Connor and Alex H. had no trouble putting down point making hits off well placed sets. The Stingers were also serving well, although not as consistently, and while the defense kept the game close, their blocking just couldn’t keep up with the Attack’s solid, hard hitting. Jared, Connor, John and Tristan each sent the ball over the net in so many different directions the Stingers couldn’t follow. Durham took the 1st set 25-20. The 2nd set saw both teams digging hard and keeping the ball in play for more tension filled rallys. It started out as a close contest but the momentum rapidly swung in Durham’s favour, thanks to their ability to read the plays and maintain their concentration. The fellas set up a solid blocking wall and continued to serve well, hit hard off superb sets and overall dominate the action. Losing 25-13, the Stingers were no match for the “poetry in motion” combination of John’s hard serving aces and Tyler’s excellent setting to Jared, Alex H. and Connor, powering Durham Attack to the gold medal. With less than a month to the Provincial Championships, it’s definitely the right time for the 16U boys to be bringing their game together. This tournament started with the Durham Attack 16U Black facing a feisty team from North Bay. With only 3 16U players, the bulk of the Laker squad was comprised of 15u players. True to form, the DA boys took their time finding their grove early in the 1st set. At 11-7, the Lakers took a strategic time out. They were proving to be no pushovers and DA needed to keep their heads in the game. It’s a simple formula; pass up, set and hit = points. The only variation is a need to mix up the sets and hits. The guys continue to work on being less predictable. DA’s service game made the difference in this set, and the final score of 25-13 down plays the excellent Laker play. In the 2nd set, Durham stuck to the formula and added solid blocking to the mix. Once again a strong performance in the serving department, this time from John, who had 5 aces through one stretch of serves, helped keep a decent lead, even as DA noticeably struggled to the 25-15 win. Game 2 vs Ottawa Mavericks was a much better display of what the boys from Durham can do with a ball. The 1st set was punctuated by vocal and aggressive play, accompanied by more excellent serving. The coaches have started mixing up the lines and it appears to be having the desired affect. As well, the proof is in the points that good vocal communicating on the court is never a negative. Durham took the 1st set with a solid 25-11 performance. The boys really put their hearts into the 2nd set, as displayed by John and Tyler at the net and Connor serving up a number of points. Once again a low ceiling didn’t help either team, but Durham seemed to handle the frustration slightly better than the Mavericks. Tyler’s sets to John resulted in numerous cross court slams, while Tristan, utilizing his long reach, taped balls just over the heads of the opposition blockers repeatedly. The final point came off a stellar diving dig by Jared, culminating in another 25-11 winning score. The next opponent was the Barrie Elites, and Durham brought to the court focused teamwork, keeping the pressure on from start to finish with solid defense and controlled offensive action. The Elite put up a good fight, but the fired up Attack team, all over the court digging, hitting, blocking and serving up point after point, took the 1st set convincingly 25-14. 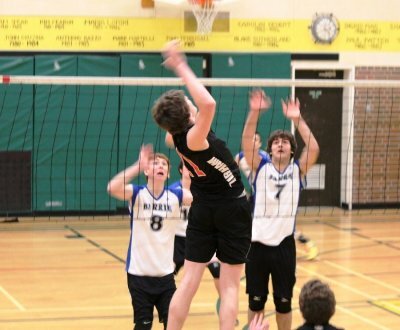 Durham was “in the zone” in the 2nd set, with Alex H. serving up aces to compliment Connor’s heavy hitting, keeping the Barrie players on their heels. Super digging from Jared kept the ball in play on more than one occasion and Tristan’s solid blocking and left side slams helped in building a respectable lead. Teamwork, like passing and backing up the setter when needed kept the momentum in Durham’s favour right through to the 25-15 final. In game 4, the Kingston Pegasus found itself playing a team that was both upbeat and positive. DA’s smiles were almost intimidating, at first, but while the service game continued working, the rest of DA’s play seemed to be off by a step. Unfortunately the low ceiling and sloppy mistakes, like out of rotation calls, started to take its toll on the guys and the frustration level rose as they started falling behind. At 11-16 DA’s coaches called a time out to regroup. That timeout had the desired effect and a comeback ensued with Alex H. serving solidly yet again and Jared slamming home hit after hit off Tyler’s sets. At 23-22, Pegasus called a potentially momentum disrupting timeout, but it didn’t work and Durham stayed with it, pulled off a 25-23 upset. Set 2 was no contest as DA overwhelmed Pegasus early and coasted to a 25-8 victory. At this juncture the final outcome was looking very positive. The defeat of Pegasus put Durham Attack into the gold medal game against Ottawa Fusion. Both teams were visibly tense in the 1st set, but it didn’t diminish the level of play as each side dug in, coming up with excellent plays on both sides of the net. DA experienced one of its longer sets of the day, the result of a number of good long rally’s. The focus was concentrated and it made for a very exciting, intense competition. Good blocking, hard serving and plenty of communicating teamwork gave DA the edge and the boys carried it to a 25-21 win. Set 2 was another long, hard fought match, with the lead changing back and forth as both sides struggled to gain the upper hand. It was an exciting match to watch, until a questionable foot fault call at the net broke DA’s concentration. Tightening up, they lost focus, and went down to defeat 19-25. The tie breaker was a bewildering series of defensive miscues and very little hitting on DA’s part. The boys, struggling to stay in contention, found themselves down 4-8 at the mid switch. Some last ditch solid serving and hard hitting brought the boys back to a threatening 12-14 before a comeback stalling Fusion time out, who then went on to take the gold medal with a 14-16 victory. A heartbreaking end to an otherwise excellent day of Volleyball, as this loss also blocked DA’s return to the Premier Division. There was a scheme, and after a slightly sluggish start to the 1st set of this tournament, it appeared to be going accordingly. Once Durham Attack woke up, fortunately in the early stages of their game against Ottawa Fusion Red, they took the lead and didn’t look back. While not actually dominating Fusion, control was never really threatened and a 25-11 win was achieved. The 2nd set was similar to the 1st, without the iffy start. Despite obstacles such as a low ceiling and even lower basketball nets, which didn’t help either side, Tristan’s serving run of 8 consecutive points bolstered the Attack’s confidence and the resulting 25-12 win never seemed in doubt. Pool game 2 vs Markham Stingers saw a very pumped Durham Attack squad take to the court. Adjusting their game to account for the aforementioned obstacles, Connor surprised with more lightly tipped balls instead of high set slams, alongside Alex H. executing his excellent down the line hits, while Alex T. and Brad provided a very solid blocking defense. Problem was, the Stingers were doing all the same things, and playing a more disciplined game. Our boys weren’t reacting quickly enough and DA‘s coach called a timeout as the lead swung in Stinger’s favour. Back on the court and talking it up a lot more, DA raised their level of play, regained the lead, kept the pressure on despite a last minute Stinger’s momentum stalling timeout and took the set 26-24. In set 2, the Attack boys were on their toes, but required a few calming words from the coaches before settling into their game. Led by excellent serving from Tristan for 5 unanswered points and then again from Alek for a further 4 points, the team came together with some inspired play. The defense, noticeably improved, had blocking walls put up by Tyler, Jon and Tristan, taking away numerous Stinger chances. Connor and John provided a good mix of directed hits all over the Stinger’s court, along with some gentle drop over balls. The boys were all over the court digging and passing, determined not to let up and relinquish this lead. All calls were not in their favour however, as they continued to make the challenge more difficult for themselves, getting called out of rotation, serving into the net and letting their focus slip, before Tristan served up the final two points for a 25-19 victory. After a short break for nourishment, the next round starting quickly, and loudly. DA was certainly hyped for this contest, overpowering Storm and pressing them into costly mistakes. Down 13-9, Storm started reading DA plays and came up with some solid blocking of their own, helping them come back and tie it 15-15. A DA timeout for another coaches corner did the trick as Jared came back swinging for all he’s worth, and points. Alex T. had some well placed serves and the rest of the squad found their missing drive, resulting in impressive digging and offensive/defensive plays, securing a 25-19 win. The 2nd set was another intense contest. Again, Connor was serving well, Alex H. was hitting with purpose and John and Tyler were blocking with aplomb. Unfortunately Storm was matching their every move. Some minor mental gaffs contributed to DA’s rising level of frustration and the boys found themselves not playing to their normal standard. Durham, again in catch up mode, appeared to have the games momentum swinging back their way when Storm took a timeout at 22-24. This strategy worked and Storm took the set 23-25. The audience was not witness to a positive start for Durham in the tiebreaker, dropping the first 5 points as they did. But with renewed concentration and well executed plays, like Brad’s settings to Connor and Jon for quick points, our team came back, took a 16-15 lead and was poised for victory. Now we come to the poem’s relevance. The winning point became a tying point, as Jared’s serve, hit out by a Storm player attempting the return, was awarded to Storm, as one of our blockers hit the net coming down; after the ball was out of bounds. Unfortunately there is no video replay in Volleyball! DA zoned out, missed the next point and lost 16-18 on a Storm ace. In the 1st set of their rematch with Fusion for the right to remain in the Premier division, Durham Attack displayed excellent court presence. Precise setting from Tyler enabled Alex H., Tristan and Jon each the opportunity to put up points, repeatedly, in a very convincing manner. Along with the required blocking, digging and passing, DA took a convincing lead and, after a very focused performance, the 25-13 win. Sadly, set 2 became another example of plans not going accordingly. The challenge was to maintain the momentum of the previous set. With Jon getting his serve back and Tyler also batting in some nice serves, a solid lead was attained. At 19-14 Fusion took a timeout, once more disrupting Attack’s fragile concentration. At 20-19 DA took a timeout but it didn’t help and they dropped the set 23-25. The tiebreaker seemed to be all Fusion. They appeared to be reading DA’s plays before they were made. While there was still some defense, DA’s energy and spirit looked to have already gone home. A loss of 10-15 ended the day for Durham Attack and their place in the Premier division. After watching the other teams in their pool play the first match, the 16U Durham Attack boys appeared ready for the day’s competition. Attack’s intense start in their 1st game had the Predators almost immediately questioning themselves, calling a timeout with the score only 3-2. Tristan, serving well and ably assisted by his teammates responsive play, rapidly brought the score to 9-3. Jon and John were a solid wall of defense at the net and with Alek at the libero position, passing up to Brad for very nice sets to Alex H. and Jared, the score quickly rose to 18-9 before another Predator timeout. That didn’t break DA’s momentum and with the guys all over the court early following the ball, a win of 25-14 was obtained in short order. In set 2, the Predators started figuring out some of DA’s plays, allowing them to grab an early lead. At 5-9, Durham got back on track, keeping the ball in motion and finishing plays in a more consistent manner. Finding themselves playing catch up, the team continued diving, digging and hitting, but struggled to put back to back points on the score sheet. Time ran out on this comeback and the Predators took the set 23-25. Durham Attack experienced a shaky start to the tie breaker and the boys efforts were not helped by some questionable officiating. This caused their level of frustration to rise, affecting their mind set and resulting in a 10-15 loss. Game 2 in the pool found Durham Attack up against Pakmen 17U. Pakmen have a very hard hitting team and this action kept the 16U boys slightly off balance in the early stages of the match. Some plays, like an ace served up by Jon and a diving hand save by Alex H. kept DA in the game, but with their difficulties passing up due to really hard hits, Pakmen quickly widened the scoring gap. While managing to keep the ball in play for some encouraging rally’s, DA couldn’t match Pakmen’s quick responses and while determined play kept the hope alive, it wasn’t enough to stop a 20-25 Pakmen win. Set 2 was a display of lost focus and miscommunications running rampant. It was all Pakmen, taking the set 9-25. After a short break for some nourishment, and words of encouragement from Coach Mike, the boys were back on the courts to face Evolution. A confident start suggested better results to come. Exciting rally’s established a fast pace to the 1st set. Some good serves and diving saves from Connor and Jared kept the point spread slim, but less than efficient blocks and long hits gave the close 23-25 win to Evolution. Set 2 saw Durham making a more concerted effort and experiencing more breaks going in their favour. An ace served up by Tristan followed by a net rollover slammed home by John helped lift team spirits. The boys were working for it now and it showed, both on the court and on the score sheet. While they had some troubles maintaining their focus, allowing Evolution to creep back, more good fortune and most importantly well executed plays enabled DA to hold on to the lead for a 25-20 win. This tie breaker was a well played match by both sides. While Evolution was getting around DA’s blocks, our boys were continually hitting hard through Evolution’s defenses. It developed into another point for point game with Durham leading 8-7 at the switch. Some tough rally’s kept the spirits high and the contest close, until Evolution tied it at 14-14. Unfortunately, all it took was a momentary let down in Attack’s concentration for Evolution to seize the last 2 points for a 14-16 victory. Durham Attack’s last match of the day was against Guelph. It was no contest as our boys seemed to have lost their drive and just didn’t appear to have their hearts in the game. Even when they did show signs of putting up a fight, they couldn’t catch a break. With no edge to their play, they dropped the set 6-25. Set 2 witnessed more bad calls, which further unsettled the boys; but even though their spirit was visibly deflated, they didn’t quit trying and displayed, albeit infrequently, some excellent plays worthy of any highlight reel. Durham Attack’s day came to an end as Guelph defeated them 15-25. Character building experiences and lessons were taken away from this day and if history is anything to go by, the boy’s will bounce back. This season is far from over. After a very successful inaugural tournament at the 17U Provincial Cup, our 16U Durham Attack Black squad brought to this tournament a good dose of confidence in their potential, and it showed. Okay, maybe not immediately as they most certainly are not morning guys and take a while to get up to speed, but once they did…..! The 1st game was against Toronto’s Leaside Thunder. True to form, Durham Attack was slow out of the gate, falling 3-8 before starting to get their game together. With Tyler setting and serving well, the comeback began. Jon eagerly handled middle duties with good hands while Connor on left side and Tristan on right responded to excellent setting with hard points getting hits. Finding their stride, DA moved ahead to 16-13, when the Thunder took a timeout, trying to regroup and break the flow. It didn’t work, and with control of the game securely in the hands of Jon and his stellar serving, helped at the net by quality blocking, Durham took the 1st set 25-15. Control was maintained in the 2nd set with Connor serving well this time, aided by an impenetrable wall of defense put up by Jon, Jared and Alek. While a good effort was made with some strong rally’s, Thunder were never really in the game and with little exertion Durham walked away with this one 25-10. Set 1 of game 2 vs Kingston’s Pegasus Wings saw a faster Durham Attack start. While not overwhelming their opponents, the Attack built a quick lead while giving away points with some careless moves. At 17-14, the boys of Durham felt the need to get a little more serious; started blocking, hitting and dropping shots just over the net, solidifying a 25-16 victory. Set 2 was closer than it should have been. DA had to clear their heads and start putting together their serving, blocking and hitting to get back into the game after the Pegasus Wings took an early lead. Again, leading Pegasus 23-14, DA had to overcome a minor attention loss which resulted in unfocused, undisciplined play, with few or no play making returns, before finally putting together some impressive second efforts to close out the set 25-20. The quarter final against Toronto Beach was a play making clinic for Durham Attack and a learning experience for Beach, playing, as they were, up a level. It was really no contest for DA as they made short work of Beach with scores of 25-8 and 25-6. The semi final vs Stingers Black was an example of the negative impact of overconfidence. Coming off such an effortless win, the boys had some difficulty getting their drive back in gear. Initially it was point for point on some pretty silly losses. At 13-11, there was a visible shift as Attack started applying some pressure with sound serving and solid net defense. Stingers took a time out at 17-11, which had the desired effect of slowing Durham’s attack. An extended rally kept things interesting but the Stingers played some excellent catch up ball, leading to a challenging and exciting run to the end. Another Stinger timeout at 23-22 didn’t affect the outcome and Attack won 25-22 after a couple of thrilling rally’s. The level of competition rose perceptibly in set 2. Both squads challenged with solid returns and every time Durham managed to get a couple of points ahead, the Stingers fought back, making for a very exciting match. Finding themselves tied at 20-20, some hard spikes and a determined defense strategy enabled Durham to outgun the Stingers 27-25. Opposite Markham’s Stingers 16U ‘A’ squad in the gold medal match, Durham Attack found themselves in a very intense contest, with plenty of impressive digging, more hard hitting and outstanding teamwork. Both teams put on a show that created much tension for the audience. A couple of serving aces from Brad, some long returns by the Stingers and John dropping balls just over the net moved DA into the lead. The Stingers unsuccessfully tried a disrupting timeout at 18-12. Bringing it when they needed it most, despite losing serve, regaining it, pounding a few home and calling a timeout of their own, Durham Attack hung on to the lead, bringing a tight set to its completion with a 25-21 win. Combining killer serves from Jon with John’s power hitting in the middle off Tyler’s sets started the 2nd set in Durham’s favour. Unfortunately the Stingers came back by reading the middle play before Attack’s coaches adjusted their strategy. Dropping behind 12-17, DA had to play catchup ball and while some good serving and solid defensive moves brought some hope, the Stingers held on to win 19-25. Now where would the excitement be if you didn’t have a dramatic tie breaking third set in the gold medal match. Carrying over the momentum initiated in the previous set, DA came out aggressively pounding the ball, but so too did the Stingers. Once more it was a close battle going point for point. Feeding on the positive energy building with each point however, Durham took the lead. Like watching a pendulum swinging back and forth, service continued to switch sides, but with superb blocking, skin sacrificing diving digs and some ace serves, Durham Attack finished it with a 15-11 Gold Medal win. 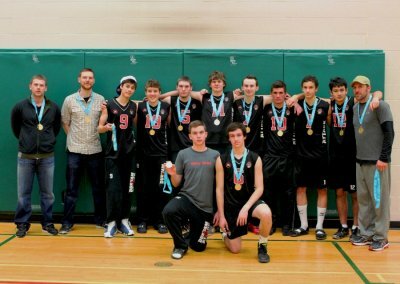 Playing up in their first tournament, the 16U boys encountered some new obstacles at the 17U Provincial Cup. Larger opponents, a higher net and adding the position of libero to the mix were challenges met by bringing in new coaches Mike and Kevin and adding two new players to the returning eight for a re-energized squad. The 1st game against Storm Thunder 16U was a good beginning. Starting slow, Durham Attack built momentum, and the lead, with solid serving, accurate sets and hard hitting. That lead was defended with strong returns and excellent blocking. The 1st set was won 25-21 and while the 2nd set saw the boys struggling to keep their focus at times, they kept their composure and took the win 25-20. Game 2, vs North Bay’s Vision VC, witnessed the boys stepping up their play as they encountered stiffer competition. It was a challenging 1st set as the teams matched point for point throughout. Bradley, setting well to Alex H. on the left and Tristan on the right, allowed for some very strong slams. Good digging and continued solid blocking from Jared, Jon and Alex T. kept the score close. A Vision timeout did have the desired effect of throwing off DA’s timing, but with some impressive second efforts they came back. Durham lost the set 26-28 but they never stopped trying. Tight action continued in the 2nd set. The coaches’ philosophy of rotating the boys so they all get used to playing with one another appears to be working. This time it was Tyler setting to Jared and Connor while John, Alek and Alex V. did the blocking and digging to keep the ball in play. Once Connor’s serving gave them a 5 point lead, they didn’t look back and although for a short period they encountered some difficulties returning serves, they stayed focused and won 25-21. For game 3 vs Ottawa’s Maverick Chargers, the starting line was on its toes from the 1st serve. Jon served for 10 unanswered points, helped along with solid blocking and hitting from Tristan, John and Alex H.. Add in Jared’s diving and digging and Bradley’s fine setting…they were really clicking. DA took this set 25-13. The 2nd set experienced the first extended rally’s of the day, as both teams started reading the plays better and stayed with the ball, enabling some excellent second efforts. It was back and forth with plenty of fast action from all directions. Mavericks took the win 25-27, but because of the points difference Durham Attack placed 1st in their pool. The quarter-final against Northumberland started after an almost 2 hour break, which didn’t help our guys. Finding themselves down 9-18, DA took a timeout, started putting plays together, found their focus and brought it back to 21-22, before Northumberland won the duel 23-25. 2nd set; another nailbiter! DA grabbed an early lead and what rally’s there were seemed to go our way, but their hold on the lead was precarious, as Northumberland chipped away. Tight discipline on both sides resulted in another close finish, this time in DA’s favour, with a 26-24 victory. The tiebreaker saw a very determined Durham Attack team dive, hit, ace and spike that ball, putting together a decisive 15-7 victory. With the Prime Minister and Mrs. Harper in attendance, the semi-final was played against the Ottawa Fusion. It was a strong start by both teams in set 1, going head to head, once again without any lengthy rally’s to slow down the game. Kidding; while it may not have been the most action packed match, it was very interesting watching the boys counter plays. It was back and forth until a 15-15 timeout by Fusion, which turned to DA’s advantage, as drop shots from John in the middle to Tyler’s setting left and right to Tristan and Alex H. saw our guys gain control and hold it for a 25-20 win. The action intensified in the 2nd set as the Attack squad played with focus and control. You could see them digging deep and it showed as rally after rally went in their favour. It was another close contest with Connor serving up some beautiful aces while Jared was swinging down the line with regularity. More than once the slim lead was preserved by some outstanding diving digs from Alex H.. Fusion certainly didn’t give any ground, even when one of their players, #7, went down with an ankle injury. We all hope it is a minor one and he’s back playing soon. In the end it was Durham Attack 25, Ottawa Fusion 23, placing DA in the gold medal round. The gold medal game was against last years Provincial and National champions, the Aurora Storm Fury. There were plenty of chances for either team to take the lead in set 1, but strong defence kept it very close. Both teams put on a brilliant display with plenty of impressive digs and spikes and slams. DA did fall behind a few points but made a valiant comeback before dropping the set 21-25. Set 2’s action picked up where it left off in set 1, with both teams hitting hard and digging deep. As should be at this level, it was another hard fought match as both teams managed to capitalize on the other’s miscues. Bouncing balls off the ceiling a couple of times didn’t help DA’s point pursuit. It was a fast paced hustle right to the end, and Storm took the set 22-25. 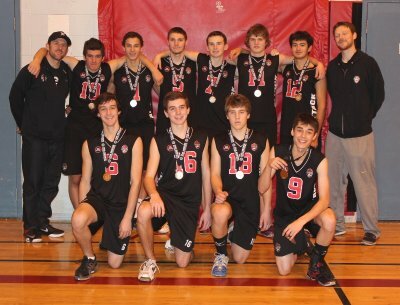 Durham Attack 16U boys picked up the 17U silver and a place in the 17U Premier division. WOW!